^ Reynolds 2005, p. 423. ^ Reynolds 2005, p. 426. ^ North, Richard (19 February 1983). “Punk Warriors”. NME. ^ Loder, Kurt (December 1984). V.U. (ライナーノーツ). Verve Records. ^ Thompson, Dave; Greene, Jo-Ann (November 1994). “Undead Undead Undead”. Alternative Press (Alternative Press Magazine, Inc.). Available here. ^ Reynolds 2005, pp. 428–429. ^ Thompson, Dave (1 November 2000). Alternative Rock. Miller Freeman Books. ISBN 0-87930-607-6. ^ Price, Simon (1999). “7. The Holy Bible”. Everything (A Book About Manic Street Preachers). Virgin Books. p. 143. "In mood as much as message, The Holy Bible was an intensely sombre record, overcast by the same stormy skies which darkened Van Gogh's last works. 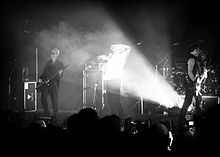 It was gothic and, quite often, literally goth: more than one song could easily have been early Cure, Sisters of Mercy or Bauhaus." Hannaham, James (1999). “Bela Lugosi's Dead and I Don't Feel So Good Either”. Stars Don't Stand Still in the Sky: Music and Myth. NYU Press. pp. 78–87. ISBN 0-8147-4727-2. Reynolds, Simon (2005). “Chapter 22: 'Dark Things: Goth and the Return of Rock'”. Rip It Up and Start Again: Postpunk 1978–1984. London: Faber and Faber. ISBN 0-571-21569-6. Collins, Andrew (30 November 1991). “Bluffer's Guide to Goth”. NME.